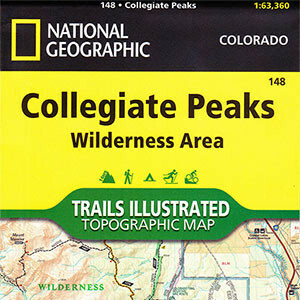 National Geographic Trails Illustrated map of the Collegiate Peaks Wilderness area. Printed in color on durable tear-resistant plastic. This map contains everything you need to navigate the trails of the Collegiate Peaks. 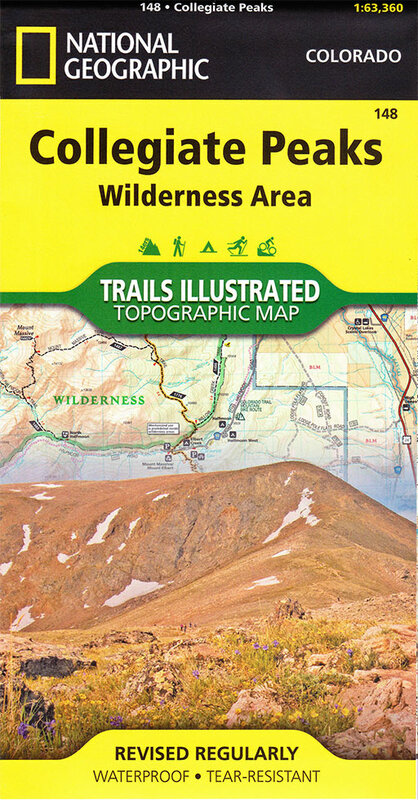 The Trails Illustrated Collegiate Peaks Wilderness map (#148) is a topographic trail map of the Collegiate Peaks wilderness area near Buena Vista, Colorado. Printed in color on durable tear-resistant plastic. 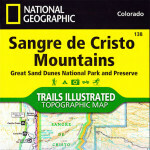 It is everything you need to navigate the trails of the Collegiate Peaks wilderness area. 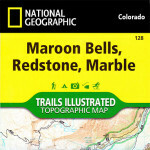 The map covers the entire Collegiate Peaks wilderness, the entire Mount Massive Wilderness, the eastern portion of the Maroon Bells Snowmass wilderness as well as parts of surrounding San Isabel and White River National Forests: Twin Lakes area, Winfield, Taylor Park, Colorado Trail, South Cottonwood Road, Clear Creek Road, Castle Creek Road, Cement Creek Road, Italian Creek Road, Independance Pass, Taylor Pass and others. TRAILS: Fryingpan Lakes Trail, South Mount Elbert, Black Cloud Trail, Lake Ann Trail, South Texas Creek Trail, Browns Pass Trail, Kroenke Lake Trail, Electric Pass Trail, Cathedral Lake Trail, Conundrum Creek Trail, East Maroon Creek Trail, Bear Creek Trail, Flag Creek Trail and more.